A hot, dry desert may be the last place you'd think of to see colorful flowers. 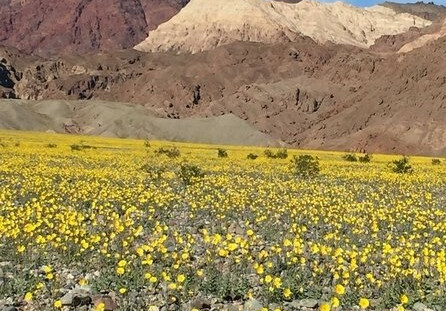 But thanks to last autumn's above-average rainfall, California's Death Valley National Park?is experiencing a "super bloom" of wildflowers—a rare occurrence that happens just once every 10 years. Death Valley holds the world record for hottest temperature ever recorded—a whopping 134 degrees Fahrenheit on July 10, 1913. Temperatures peak in the summer, and cool off slightly in the winter, which also coincides with the "rainy" season. The Valley's annual rainfall is just two inches—sometimes it gets no rain at all. But this year, the park got over three inches of rain during the first two weeks in October. The above-average rainfall was enough to trigger the growth of millions of wildflower seeds that have been dormant for years. The last time there was a bloom of this magnitude was in 2005, and the time before that was in 1998. What kind of flowers can you seen in the desert? The most abundant and eye-catching wildflower is the aptly named desert gold, a large, bright yellow bloom that looks like a daisy. The stems this year are growing to waist height, and the flowers cover entire hillsides and vast areas of the valley floor in the southern section of the park. These flowers are easily enjoyed from the car. Some of the other more common flowers include the deep purple phacelia; the desert five-spot, a delicate pink flower with five burgundy spots around its center; the gravel ghost, a delicate white flower that appears to be floating aboveground like a ghost because its stem is so thin it's almost invisible; and various types of desert primrose. How long will I be able to see the wildflowers bloom? The show won't last forever. Most of the flowers will wither in the next few weeks as temperatures start to rise. Some flowers may be around as late as June at higher elevations, but those won't be as easy to see from a car and could require hiking. What part of the park has the best blooms? Now, the best flower show is at the south end of Death Valley National Park along Badwater Road, south of Furnace Creek. As the temperature rises, those flowers will fade, and the bloom will move north and to higher elevations.